Upper Perk Physical Therapy & Sports a Rehab offers young students considering college, or those currently enrolled to discover whether physical therapy is the career path for their future. Our current Clinical Education program offers students a one of a kind mentorship experience to service the community. UPPT is proud to work alongside area High Schools, Universities & Colleges. 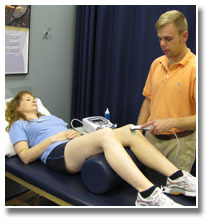 In addition to, we support the American Physical Therapy Association. To achieve Vision 2020, the APTA promotes developing the following principles of Identity, Quality, Collaboration, Value, Innovation, Consumer-centricity, Access/Equity, and Advocacy. Students are challenged in a one-to-one internship experience to learn about these principles, to implement them in future pursuits. Identity. Learn how the physical therapist evaluates and diagnoses impairments, activity limitations, and participation restrictions; and provides interventions. Quality. UPPT is committed to establishing and adopting best practice standards across the domains of practice, education, and research as the individuals in these domains strive to be flexible, prepared, and responsive in a dynamic and ever-changing world. As independent practitioners, doctors of physical therapy in clinical practice will embrace best practice standards in examination, diagnosis/classification, intervention, and outcome measurement. Collaboration. Observe and learn how the physical therapy profession will demonstrate the value of collaboration with other health care providers, consumers, community organizations, and other disciplines to solve the health-related challenges that society faces. Value. Value is to ensure services that the physical therapy profession will provide will be safe, effective, patient/client-centered, timely, efficient, and equitable. Innovation. The physical therapy profession will offer creative and proactive solutions to enhance health services delivery and to increase the value of physical therapy to society. Access/Equity. The physical therapy profession will recognize health inequities and disparities and work to resolve them through with care and attention alongside consumer companies to expand the benefit provided by physical therapy, serving as a point of entry to the health care system, and direct outreach to consumers to educate and increase awareness. This service is offered at the Upper Perk location. For further assistance and questions or applications feel free to contact the office at 215-679-0105, or email Dominik.Kowalewski@UpperPerkPT.com.